Who Is Spying On Turkish Journalists In The US? Adem Yavuz Arslan has a general idea of when the surveillance started. The Fairfax, Va. community swimming pool where the exiled Turkish journalist takes his children closed for the summer on Aug. 30, and it was just before then that a covert photographer snapped pictures that ended up being published in Sabah, a Turkish newspaper that is effectively controlled by Turkey’s authoritarian president, Recep Tayyip Erdogan. 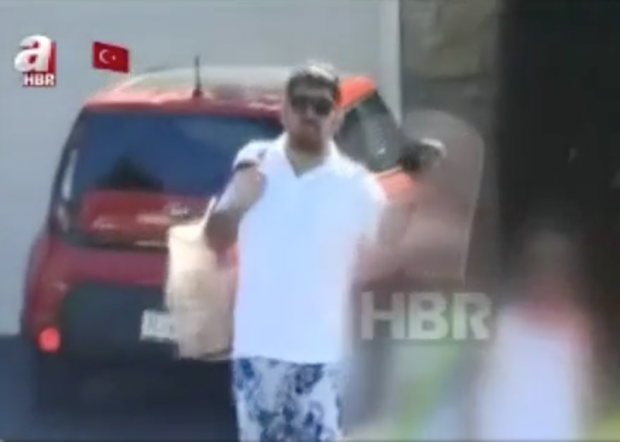 Aydogan Vatandas, also a journalist from Turkey, knows the exact time he was spied upon: Sept. 16 at 11:30 a.m. outside of a bookstore in Clifton, N.J.
Arslan and Vatandas are two of six U.S.-based journalists born in Turkey who talked to The Daily Caller about being surveilled. All found their pictures blasted across Turkish media outlets in late September. Most of the photos, and some videos, were posted at various pro-government news outlets, including Sabah, which is controlled by Serhat Albayrak, the brother of Berat Albayrak, Turkey’s energy minister and Erdogan’s son-in-law. To a man, the six journalists — five green card holders and one American citizen — believe that the Turkish government is behind the spying. “Of course, of course, of course, most definitely,” Vatandas said when asked whether he thinks the Turkish government orchestrated the surveillance, which took place in August and September. “Absolutely, no doubt,” says Dr. Emre Uslu, a former columnist for Today’s Zaman, an opposition newspaper shut down by Turkey’s government last year. “I have no doubt that it was Turkish government behind the surveillance,” said one of the surveilled journalists, a naturalized American citizen living in Virginia who asked no to be named. “Of course,” said Ahmet Sait Yayla, a professor at George Mason University and a former top official in the Turkish national police’s counter-terrorism division. Michael Rubin, a resident fellow at the American Enterprise Institute with expertise in Turkey, agrees that that Ankara is most likely behind the surveillance campaign, which appears coordinated in timing and technique. “It’s pretty much a certainty at this point that Turkish intelligence was running hostile operations in the United States against Turkish Americans, Americans involved with Turkey, and journalists,” Rubin told TheDC. Turkey’s spying and surveillance of private citizens in foreign countries has become an issue of growing diplomatic concern in recent months. Turkish operatives in several Western countries, including Germany, Belgium, the Netherlands, Sweden and Norway, have compiled lists of opponents of Erdogan and his political party, AKP. Germany’s interior minister informed the Turkish government last week that it would not be allowed to spy within its borders. Der Spiegel, the German newspaper, published a detailed report of spying being carried out in non-Western nations such as Mongolia, Japan, Nigeria and Kenya. Also last week, a pro-government news outlet, Aksan Daily, reported that surveillance is being conducted on 12 hotels in Pennsylvania. That locale is of central importance to Erdogan and his loyal followers. The Islamist autocrat desperately wants the U.S. government to extradite Fethullah Gulen, a Muslim cleric living in self-exile in Saylorsburg, a town in the foothills of the Pocono mountains. Though former allies, Erdogan alleges that Gulen, who is in his late 70s, orchestrated the failed coup attempt in Turkey in July. And it is under the cover of fighting terrorism that Erdogan has arrested hundreds of journalists in Turkey, detained tens of thousands of private citizens, and ousted tens of thousands more from their government jobs. Most of those who have been surveilled — in Turkey, Europe and the U.S. — have been accused of being members of what the Turkish government calls the Fethullah Terrorist Organization, or FETO. The targeting of government critics hits home directly for Yayla, the George Mason professor who worked for two decades in counter-terrorism in Ankara and Sanliurfa, a city near the Syrian border. Now an adjunct professor of criminology, Yayla’s 19-year-old son has been in jail in Turkey for eight months. He was arrested following the failed July coup attempt because he had a $1 bill in his back pocket. Yayla believes he was initially targeted by Erdogan’s regime because he wrote articles in World Policy Journal detailing how ISIS fighters have been allowed to pass through Turkey. As a top counter-terrorism official, Yayla says he had direct testimony from ISIS terrorists to support the claim. Naturally, Erdogan found this embarrassing because it undercut his public claims that Turkey, a member of NATO, is supporting its Western allies in the fight against the terrorist group. “It is beyond intimidation, he wants me to shut up, and that’s the reason he’s keeping my son in prison,” Yayla said of Erdogan in a phone interview. “I never thought they would touch my son. I never thought they would go that low,” he added, noting that the homes of family members in Turkey were searched after his son’s arrest for evidence that they support Gulen. Nothing was found, but Yayla’s son remains in jail. Yayla is defiant in the face of the intimidation campaign. Yayla was surveilled on George Mason’s campus, after Sept. 15, when he testified to the House Foreign Affairs Committee about Turkey turning a blind-eye to ISIS activities. It is feasible that Turkey’s spy agency, Millî İstihbarat Teşkilatı, or MIT, could be involved in the surveillance effort, says Yayla. 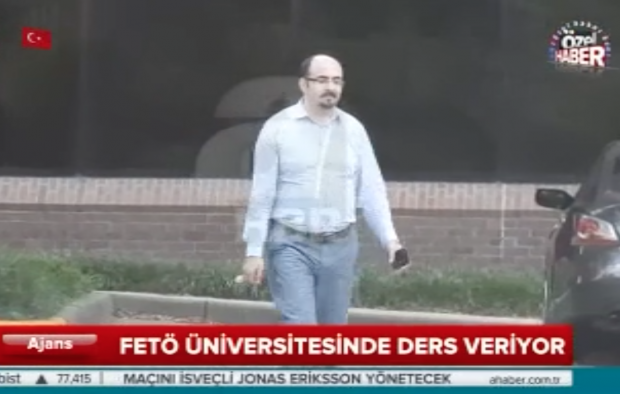 Abdurrahman Şimşek, the Sabah journalist who wrote the article about him, was suspected of being an MIT agent, he told TheDC. Vatandas, who was surveilled outside of the New Jersey bookstore, also believes that MIT could be involved in the spy campaign. A former reporter for Today’s Zaman and the author of a dozen books, including “Hungry for Power: Erdogan’s Witch Hunt and Abuse of State Power,” Vatandas says he first became aware he was being followed in early September. “A van was following me, and the driver had a Turkish look,” recalls Vatandas, who has a green card and came to the U.S. in 2006. The surveillance spooked the reporter, and so he took his wife on vacation for a week to Arizona. After returning on Sept. 15, Vatandas was recorded on video the next day. “I was scared,” he admits. The theory that MIT could be involved in the surveillance is not without merit. Several European governments have discovered that the Turkish spy service has spied on private citizens, most suspected of being Gulenists, living within their borders. Some of the spy activities are even being operated out of Diyanets, networks of mosques controlled by Ankara. “It is clear that the Turkish secret intelligence service, MIT, is investigating people living in Germany,” Boris Pistorius, the interior minister of Germany’s Lower Saxony region, said at a recent news conference. At least two of the journalists who talked to TheDC were directly threatened with kidnapping and surveillance on Turkish television just before they were surveilled. Uslu and a reporter named Tuncay Opcin were named in mid-August during a segment on Kanal 24, a Turkish television station. “One morning we will wake up and see some scum being caught at Sabiha Gokcen Airport,” said one of the journalists, referring to the airport in Istanbul. He then named Uslu and Opcin as potential kidnapping victims. Uslu, who has been in the U.S. since 2001, says that he has been the target of two surveillance campaigns. The first time he was followed, in 2014, his stalkers took pictures of him, his wife, his children and his vehicles. But the photos then were more the work of an amateur compared to the latest photos. The most recent round of surveillance began at the end of August or beginning of September. He was tracked at his workplace at Virginia International University, at his home and at Home Depot, where he was shopping for a home remodeling project. “The purpose of this so-called journalism is to intimidate us,” Uslu says of Sabah’s publication of his photos. Asked if the surveillance frightened him, Uslu says “of course” it does. Opcin, who now resides in Houston, says that the surveillance against him occurred on Sept. 11 at a shopping mall. Opcin chalks his targeting to his intense criticism of Erdogan’s government and his work as an investigative journalist. “I am very straightforward on Twitter as well,” he said, adding that he has been told by friends still in Turkey of a “potential kidnap plot” against him. Both Opcin and Uslu say they contacted the FBI about the surveillance against them. The bureau declined to comment for this article. One of the surveillance targets asked not to be named for this article. An American citizen, the man says that he was videotaped on Sept. 6 or 7 with his wife, who was born in the U.S.
“She was very shaken,” he said. The man, who came to the U.S. in 1993 and was naturalized in 2008, says that he was targeted because Erdogan supporters believed that he was passing order from Gulen to people back in Turkey. “It’s a made up story,” he says. Arslan, the reporter who was surveilled while taking his children to the swimming pool, says that he became a major target of Erdogan because of his critical coverage of a corruption scandal that broke open in Dec. 2013. Dozens of AKP members were arrested as part of the corruption investigation, which involved millions of dollars of kickbacks in a scheme aimed at getting around sanctions against Iran. Erdogan blamed Gulen and his supporters in the Turkish government for plotting the probe. A degree of familiarity with Erdogan has also put a bullseye on Arslan’s back, he says. As a reporter for Ipek Media Group, Arslan frequently flew on Erdogan’s airplane as part of a traveling press pool. “Erdogan knows me personally. Because of this, I believe he and his associates, most of whom I also know very well personally, hold a special grudge on me,” he says. His surveillance was more extensive than others TheDC talked to. In addition to being followed to the swimming pool, Arslan was also photographed while driving for Uber, a gig he picked up in late August. 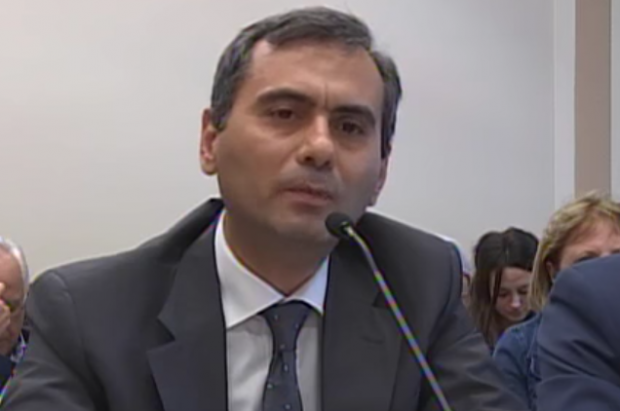 Arslan, along with Uslu, was also assaulted by Erdogan’s bodyguards last April 1 in a now-infamous encounter outside of the Brookings Institution in Washington, D.C. Widespread effort to intervene in U.S.
Rubin, the AEI scholar, says that the U.S. government should come down hard on Turkey if the government is involved in the surveillance. “U.S. law enforcement should certainly interdict and arrest any Turks or agents on their behalf who are involved in operations on U.S. soil,” says Rubin. He noted the evidence that the Turkish regime has used Turkish journalists and civil society organization as cover for espionage activities. Emails sent to Berat Albayrak, Erdogan’s son-in-law, laid out a plan to use journalists to gain access to U.S. politicians and think tanks. The Turkish government is also spending millions of dollars each year to lobbyists and law firms to investigate Gulen and a network of charter schools operated by his followers. Flynn retroactively registered as a foreign agent of Turkey last month for work he did between August and November last year. Flynn’s consulting firm, Flynn Intel Group, was paid $530,000 by a Turkish businessman with close contacts to Erodgan to conduct research on Gulen.